We have records of lots of schools from the late 18th Century to the early 20th Century although we don’t know how many were operating at any one time. Many of these were short-lived, many were run by and for ladies and most of them we know very little about except for a brief mention in the newspaper or trade directory. 26 High Street – we know from an abstract of title that part of this building was used as a school from the 1790s to about 1850. It is thought that the school occupied the Long Room, a large building behind the shop accessed down a little alleyway. The following teachers appear to have run schools in this building. Mrs Underwood – mentioned in the abstract of title for the property as being a governess of a boarding school and listed as running a boarding school there in 1791 directory. We don’t know any more about her. James Moxham – mentioned in 1840 Tithe Survey as occupying the property (then described as being a’playground etc’) and listed in an 1830 trade directory as running a Gents Boarding School. We can’t identify this James Moxham in any of the census or other records. He may be the same person who is noted in the records of the Guardians of Thornbury Union. In 1855 there is a record of James Moxham received seven loaves as outdoor relief for himself, his wife and five children. William Jarman Cross’s school – there was another school building mentioned in the 1840 Tithe Survey (Plot 254 a yard adjoining with schoolroom occupied by Abraham Cole and William Cross). We believe that Abraham Cole was occupying the Royal George building and William Cross was using the school room. William was a baptist minister from 1832 to 1844 and may have run a school here. Miss Milgrove – an advert published in 1799 shows Miss Milgrove was moving from Bath and opening a school for ladies in Thornbury. We know she was mentioned in the will of John Crowther as the tenant of Porch House in Castle Street in 1808. We believe that she was born in Bath in May 1764 and that she was the daughter of Benjamin and Sarah Milgrove. She appears to have moved to Bristol by 1814 as she was a founder of the Bristol Refuge Society in 1814. This was an establishment for 40 females in Lower Castle Street and appears to have been created for ‘fallen women’. She died on 9th March 1856. The obituary in the Bristol Mercury described as ‘ a lady of superior intellectual endowments and deep piety’ and explained that from the formation of the society to her death ‘she lived in that house and acted as the unwearied and unpaid friend of that useful institution‘. John Croome – we know from the 1800 Land Tax record that John Croome owned and occupied one of the three houses located on the site of the present 3 & 4 The Plain. John married a widow, Lydia Gastrell, in Thornbury on 21st June 1791. The report of their marriage in the Bath Chronicle of 30th June 1791 says that John was a schoolmaster and Mrs Gastrell was governess of a school for young ladies. We know that John and Lydia’s daughter, Eliza, became a schoolteacher like her parents and she married John Lane. Mrs Eliza Lane – Eliza, the wife of a plumber, John Lane, ran a school at their home 4 High Street from 1841. By 1851 census she had moved to 4 Castle Street but by 1859 Rate Book and the 1861 census she was back at 4 High Street and she stayed there until she died in the late 1860’s. Her daughter Mary Elizabeth was helping her running the school in 1861 census when they had two pupils living with them and in 1866 she was advertising the school then described as a seminary which she appears to have been running on her own. Mrs Lydia Whitfield – a 1856 directory lists Lydia as running a ladies school in the High Street. Lydia was the daughter of Eliza Lane and we suspect she was involved in the running of the same school at 4 High Street (see above). Miss Maria Laver – the trade directory says Maria Louisa Laver ran a ladies boarding school in 1877 at Thornbury Cottage on the corner of Kington Lane. We understand from the Society of Thornbury Folk that she kept a school there for many years. Miss Wagstaffe – a notice published in 1786 shows that Miss Wagstaffe was closing her school in Thornbury and moving to Bath. A note dated 1780 in the documents relating to the property owned by John Rudge refers to an Elizabeth Wagstaffe who was occupying a property thought to be 5 High Street. We don’t know any more about this lady. Emma Ellis – the 1861 census shows that Emma Kingdon was a schoolmistress living at The Priory in Castle Street. In early 1862 she married Walter Ellis, a chemist. An advert appeared in the Bristol Times and Mercury on 3rd January 1863 saying that the Thornbury School for Young Ladies was run by ‘Mrs Ellis and Miss Kingdon’. We assume that Miss Kingdon was Emma’s younger sister. This school may have been located at 9 The Plain which is where Walter and Emma lived at that time. They moved to live in Bristol for a few years but in 1869 she advertised for an ‘Establishment for Young Ladies, High Street, Thornbury conducted by Mrs W. Ellis’. Her terms were (all per annum) Board and instruction 16 guineas, Weekly boarders 13 guineas, Daily pupils three guineas, Daily pupils under 7 years of age two guineas, music and french each four guineas and Drawing, Singing and Dancing three guineas each. Miss Bletchley – according to a 1830 directory she was running a ladies boarding school in Thornbury. We don’t know any more about her nor where the school was located. Ann D’Arville – according to a 1852 directory Ann was running a boarding school ‘in Thornbury’. We assume that Ann was the daughter of Revd George D’Arville who had been Curate at Thornbury St Marys Church and master of the Thornbury Grammar School. The D’Arvilles were living in Olveston in the 1851 census and it appears that Ann was running a little school there and there were three scholars visiting the house. We have been contacted by Philippa Dye who has shed some light on the location of the school. She has told us that according to a family diary in 1843 her three times great grandmother was taught at Miss D’Arville’s school in ‘Down House, Thornbury’. We believe therefore that the school was at Down House, Old Down throughout this period. By 1861 Ann D’Arville was living at Weston in Somerset where she was merely described as a ‘fundholder.’ She died in Weston in 1883. Maria Dursey – Mrs Dursey appears to have had a boarding in Thornbury High Street for young ladies in the early 1840s. We know that she had an ‘Establishment’ in the High Street in Thornbury as early as 1842 because tickets were available for Miss Reid’s Ball for her pupils from Mrs Dursey at that address. The history of Red Maids School in Bristol appears to indicate that Mrs Dursey was briefly headmistress there in 1839. 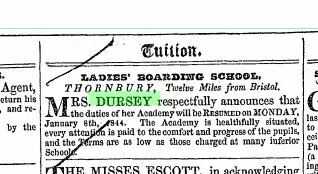 A notice published in 1846 shows Mrs Dursey was re-opening her ladies boarding school in Thornbury. It appears she must have been unwell and it mentions that ‘after a residence at a watering place she had now completely re-established her health’. A later notice printed in May 1847 shows she had now died and they were selling off her possessions at her home opposite the Market Place in Thornbury. We cannot identify where her school was located. Apart from her death in Thornbury we can found no record of Maria anywhere. Louisa Jefferies – according to a 1830 directory she was running a ladies day school in Thornbury. We don’t know any more about her nor where the school was located. Miss Reid – we have three images of newspaper notices in December 1842 and December 1843 indicating that Miss Reid ran a school. On both occasions she organised a ball at the White Hart on The Plain and she invited her pupils, friends and inhabitants to buy tickets to attend. We don’t know where the school was located nor any more about Miss Reid.